From Native American roots to a 1980s restaurant review and now cookbooks and festivals, the once humble dish continues to spread through the South and beyond. Southerners now recognize shrimp and grits dish as a staple dish, so much so that the South is sometimes referred to as the “Grits Belt.” Georgia named grits its official prepared food, and even Outkast sings about “fish and grits!” So what is so special about this seemingly simplistic meal? Surprisingly, while eating grits has a rich and deep history in the South, the popular combination of shrimp and grits in more upscale cuisine is fairly recent. Grits’ origins come from the Native American Muskogee tribe’s preparation of Indian corn similar to hominy. Traditionally from the southeastern woodlands, the Muskogee would grind the corn in a stone mill, giving it the “gritty” texture we are all familiar with. From this tribe, the preparation was passed down to settlers in the area because hominy was used as a form of currency. There are also known writings from the Gullah Geechee, descendants of slaves from West Africa, that mention meals resembling shrimp and grits. This is most likely because the Gullah slaves would periodically receive allowance or food, including grits. Making the most of their local resources on the coast, the Gullahs would catch shrimp and other fish in nets and cook them in a variety of ways, including with grits. Since then, shrimp and grits had remained a breakfast dish found mainly in the lowcountry marshes near the Southern coast. However, in 1982, when Bill Neal became a chef at Crook’s Corner, a restaurant in Chapel Hill, North Carolina, he forever changed the status of shrimp and grits. Neal used a simple recipe of cheese grits fused with cheddar and parmesan as a base, and then topped it off with jumbo shrimp as well as mushrooms, bacon and a few other ingredients. After Craig Claiborne of The New York Times visited the restaurant and published Neal’s recipe in 1985, the once humble dish started gaining widespread popularity. Shrimp and grits was spreading throughout the South by the mid-1990s and also popping up in fine dining restaurants as a dinner entree. Because of its versatility, there are multiple variations of the dish that can be found throughout the country, depending on local ingredients and preferences. Spicy shrimp and grits with Cajun flavors can be found at Magnolia’s in Charleston; some versions, like the one at Commander’s Palace (pictured at top) in New Orleans, top off shrimp and grits with a delicious barbecue sauce; or, you can stick with the more traditional take, still found at Crook’s Corner. 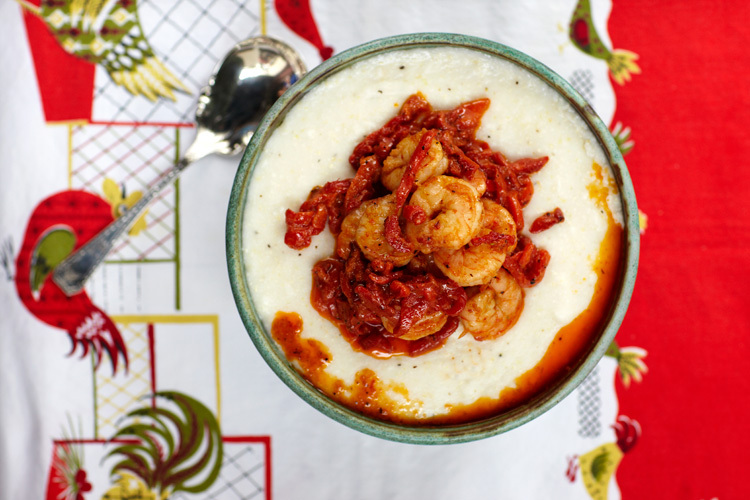 With so many options for shrimp and grits, Nathalie Dupree, prominent Southern food writer, came up with a cookbook dedicated to showing the versatility of this one dish. Each September, Jekyll Island, Georgia, celebrates the dish at the annual Shrimp & Grits Festival, and shrimp and grits was even announced as San Francisco’s “dish of the month” at the beginning of 2014 on Chowhound, asking readers to try as many version of the dish as possible in the Bay Area. With the combination of fresh shrimp, creamy grits and your choice of topping — whether it be sausage, bacon, tomato and butter sauce, bellpeppers, or a fried egg — shrimp and grits is bound to remain a fundamental Southern dish that will continue to expand its recognition and acclaim. Photo credits, from top: Shrimp and grits from Commander’s Palace from Flickr Creative Commons by Derrick Jefferson and Shrimp and Goat Cheese Grits With Roasted Red Pepper Sauce courtesy of Tupelo Honey Cafe.